A new inter-modal travel planning app improves mobility in rural areas by connecting the main travel network with taxis and carpooling schemes. 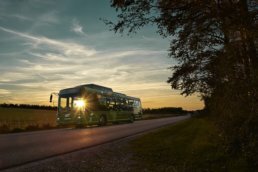 In North Jutland, the region’s transport service organisation (Nordjyllands Trafikselskab) is busy incorporating private cars into the public bus network. Nordjyllands Trafikselskab (NT) is owned by the Northern Jutland municipalities and the North Denmark Region. NT has launched a new travel planning app which includes public transport, GoMore carpooling, ‘Plustur’ for remote areas, long distance buses and taxis. Soon ‘Flextur’, which picks up travelers at their front door, will also be added. With the travel planner, ‘MinRejseplan’, launched in April 2018, it is possible for people in North Jutland to plan their journey across different modes of transport and transport service organizations. With the app ‘MinRejseplan’, travelers in the North Region of Denmark can easily access solutions tailored to their individual needs. for better use of the region’s existing infrastructure and road capacity. Public transport becomes more efficient and reliable, even bringing citizens from door to door without extra charges. At the same time, the new services allow citizens to choose more environmentally friendly transport means without compromising on convenience. The project has thereby improved mobility in the northern part of Jutland and made its citizens less dependent on having their own car. By reimagining public transport, NT improves citizens’ mobility in both the city and countryside, creating a functional, accessible alternative to privately owned cars. Efficient public transport is key to a well-functioning society. By strengthening transport, citizens’ well-being and quality of life is improved while getting them faster from A to B. Through partnerships with other transport service organisations, NT not only increases the use of public transport, but also offers citizens an efficient way of travelling.